Making compost tea is super simple! 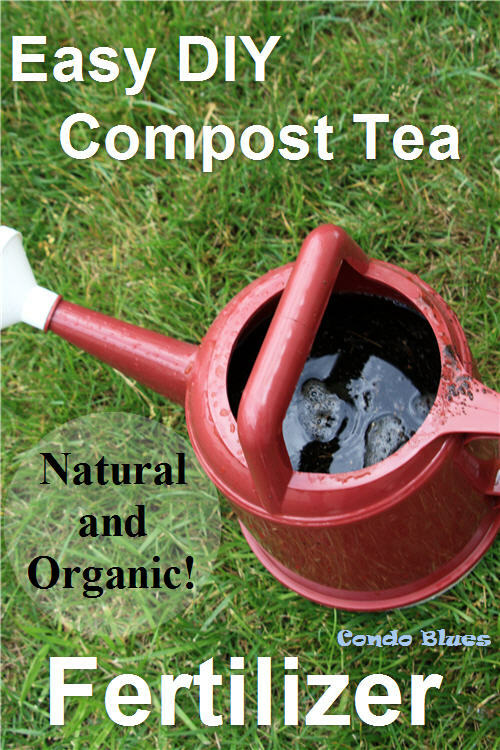 If you can brew a cup of household tea, then you have most of the skills necessary to brew compost tea. Although I wouldn’t drink it. Compost tea probably tastes like dirt. There are many ways to make compost tea but the things they always have in common are room temperature non chlorinated water, compost, aeration, and time – from two to 5 days depending upon the method you use. Finished compost. If you do not have a compost bin you can buy Compost Tea Bags to use. 2 tablespoons of or molasses and/or liquid seaweed (Optional) – Some folks add it. I didn’t have any so I leave it out. You don’t need a mesh bag to brew compost tea. You can brew compost tea with loose compost in the bucket but it could clog the aeration pump and be a hot mess to clean and strain when it is finished. That’s why I recommend using some sort of porous bag to hold your compost while the tea is brewing. 1. Fill a bucket with non chlorinated water. The chlorine in tap water that kills the germs that could make you sick will also kill the beneficial microbes your plants will thrive on in the compost. No worries! Stick a bucket of tap water in the sun for 24 hours before you make your compost tea. The sun will burn off the chlorine in the tap water and you’ll be good to go! I’m using water from my rain barrel rock. 2. Fill the mesh compost tea bag with finished compost. You want one part of compost to the 3 parts water in your brew bucket. 3. Optional: Add the molasses and/or liquid seaweed to the compost and water mixture to encourage happy microbes. Both methods work well as long as you keep the compost tea in a shaded area. Direct sunlight might kill all of the beneficial microbes you want in you’re your plants to take advantage of in the compost tea. The foam on the top of your compost tea concentrate is a good thing! It is sign that the nutrients, bacteria, fungi, nematodes and protozoans in your compost is ready to to work their beneficial magic on your plants. 5. Pour the compost tea mixture into a bucket through a dedicated colander or piece of screen to strain out any possible floaties that could clog up your watering can. 6. 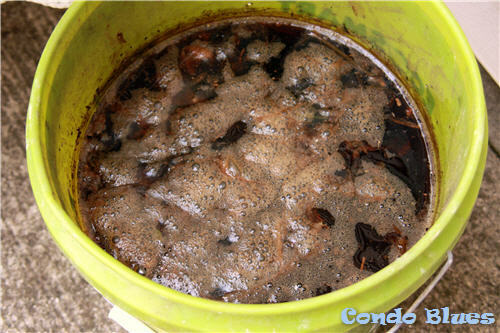 Pour 5 parts water to one part compost tea concentrate in a water can. Make sure you dilute your compost tea before you use it! Full strength compost tea can burn your plants and do more harm than good. 7. Use the watering can to apply the compost tea to your plants.